Looking for a way to showcase spring strawberries at their peak in your Mother’s Day menu this year? 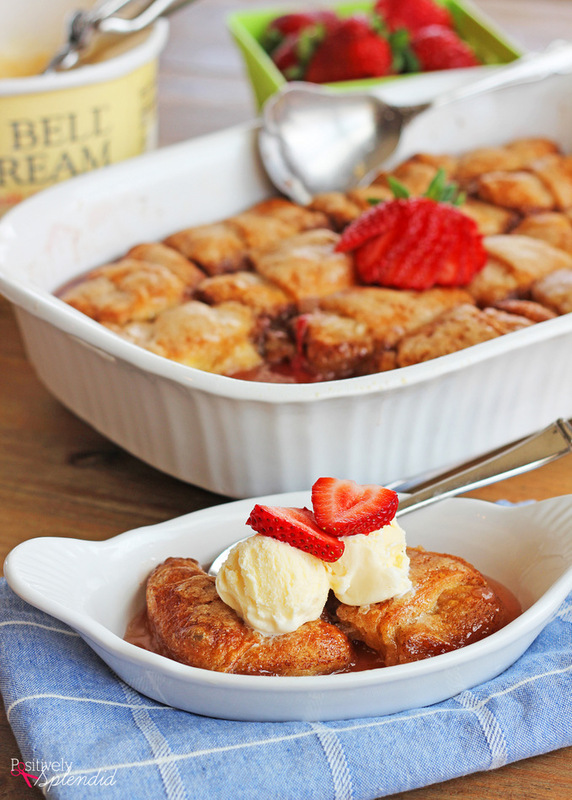 This strawberry dumpling recipe might be just what you’ve been craving! 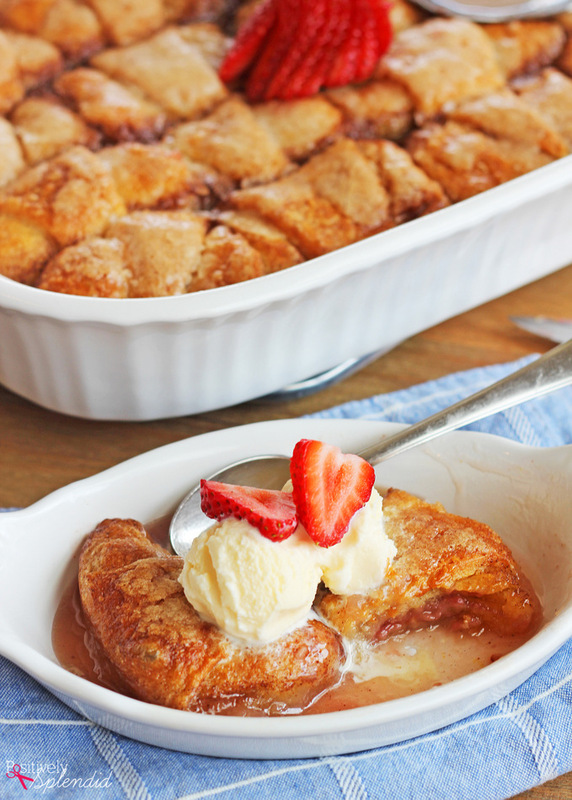 These would be a downright decadent addition to a Mother’s Day brunch, or served topped off with a dollop of vanilla ice cream as dessert after a special dinner. 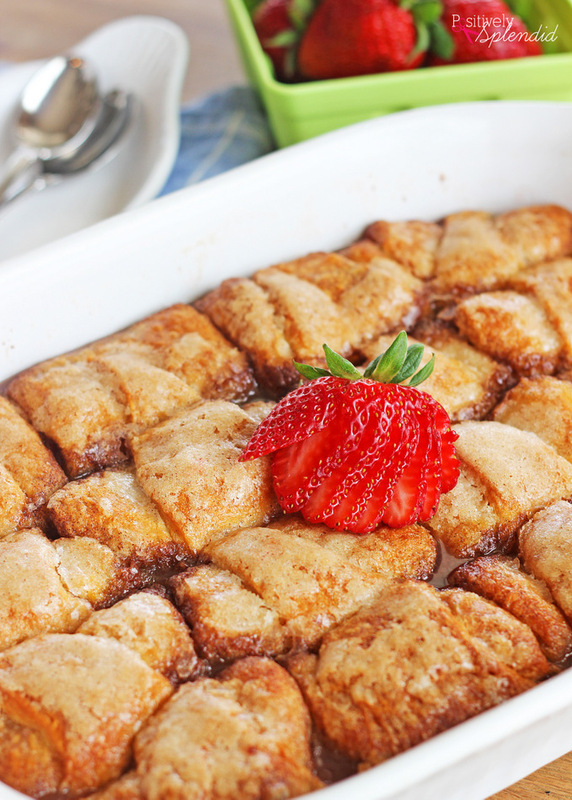 Made quickly and easily with an unexpected ingredient–crescent roll dough–this recipe is one you’ll want to make all spring long! This is a sponsored post written by me on behalf of HEB. All opinions are entirely my own. 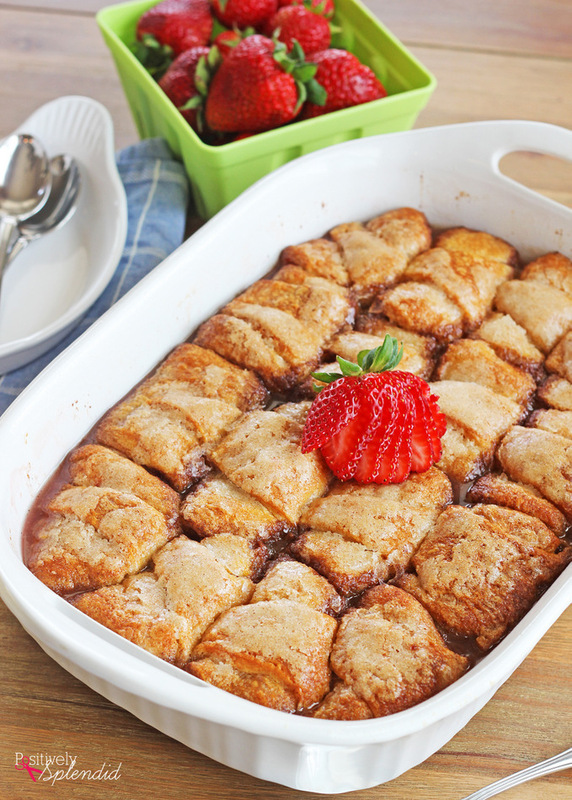 These strawberry dumplings are filled with fresh strawberries and strawberry preserves so each and every bite is a luscious combination of caramelized dough and strawberry sweetness. And the dumplings make their own sauce as they bake, which is absolutely lovely spooned over ice cream! HEB carries everything you need for this yummy recipe, which means you can streamline shopping and focus more on what is truly important this Mother’s Day: Mom herself! 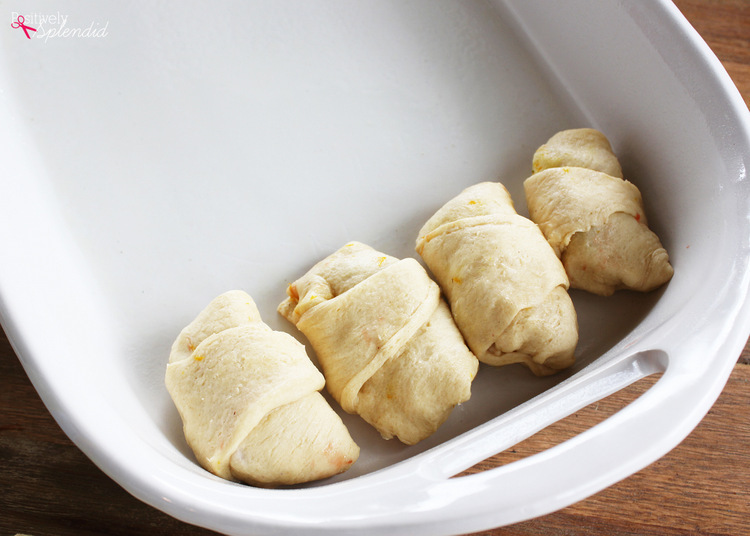 Open the cans of crescent roll dough, and unroll each sheet, separating each one into triangles. 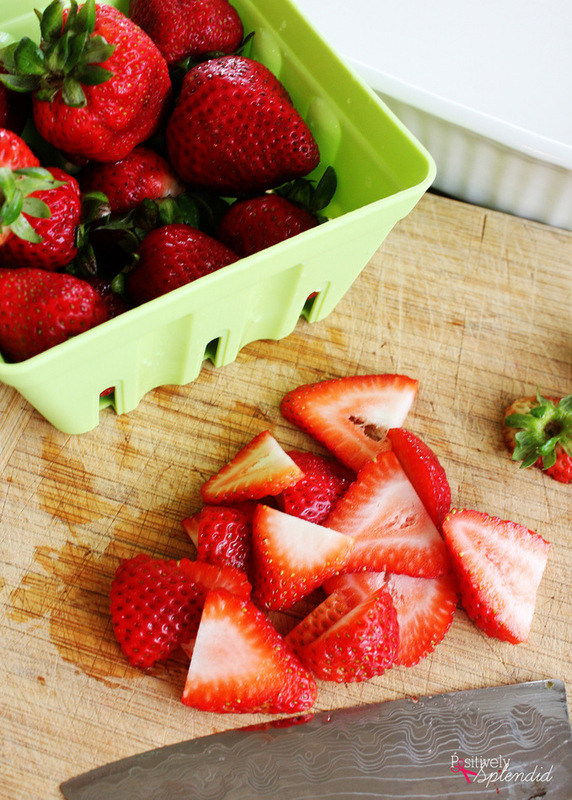 De-stem and slice the strawberries, and set aside. Working with one crescent roll triangle at a time, spread approximately 1/2 teaspoon of the strawberry preserves onto the wide end of the triangle, as shown. 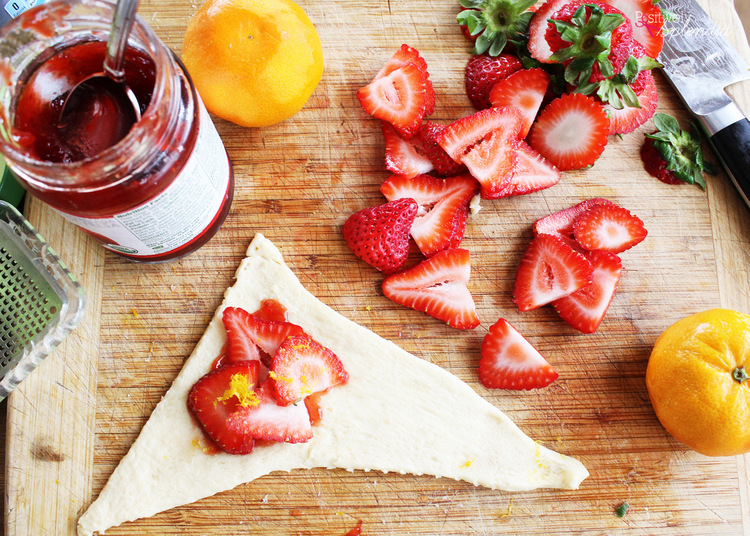 Place 3-4 strawberry slices on top of the preserves, and then sprinkle with a small amount of the orange zest. Tuck the outer points around the strawberries before rolling the dough into a tidy little pouch, pinching the ends to seal. Place the rolled dumplings into a greased 9×13″ baking dish, placing four dumplings in each row, as shown. Repeat this process with the remaining dough until you have completed 16 dumplings. This recipe is a terrific way to get kids involved in the kitchen, as it lends itself so well to being done in an assembly line fashion! Combine the butter, sugar, cinnamon and vanilla extract in a medium bowl. 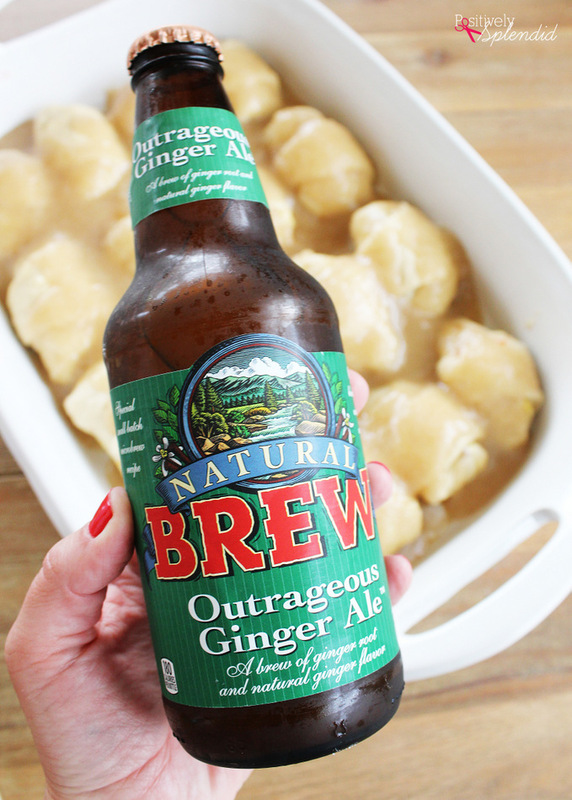 Pour evenly over the dumplings in the pan. Place pan in a preheated 350-degree oven and bake for 40-45 minutes, or until browned and bubbly. Remove pan from oven and cool at least 15 minutes before serving. Serve warm, topped with vanilla ice cream and fresh strawberry slices. I vividly remember the first Mother’s Day meal I ever hosted. It was just after my husband and I were married, and we hosted both sets of our parents in our home. I was so nervous about the meal, meticulously planning every detail to make both of our mothers feel extra special that day. I served little miniature strawberry cakes with vanilla ice cream for dessert. To me, strawberries and Mother’s Day always go hand-in-hand! 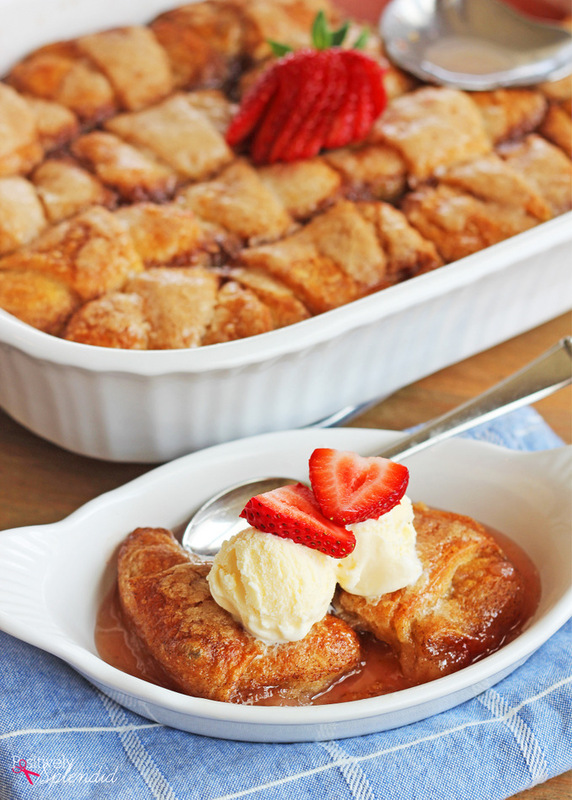 Caramelized dough filled with fresh strawberries and bathed in a delicious sauce. Perfect served with vanilla ice cream! Open the cans of crescent roll dough, and unroll each sheet, separating each one into triangles. Set aside. De-stem and slice the strawberries, and set aside. 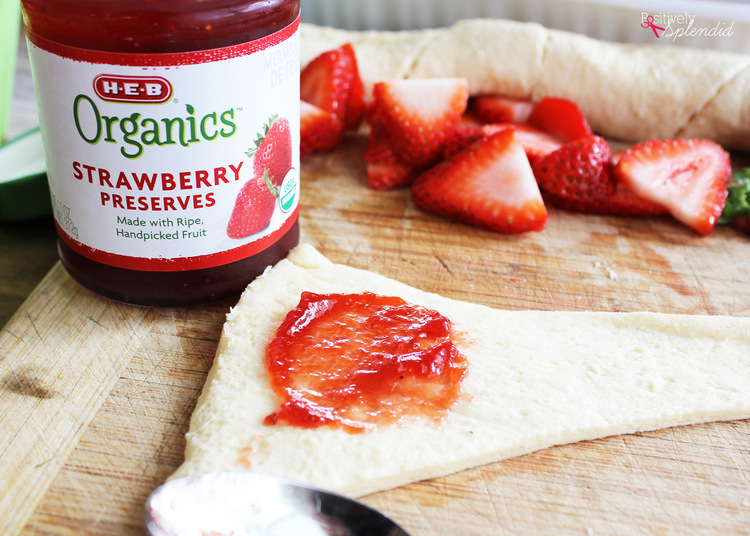 Working with one crescent roll triangle at a time, spread approximately 1/2 teaspoon of the strawberry preserves onto the wide end of the triangle. 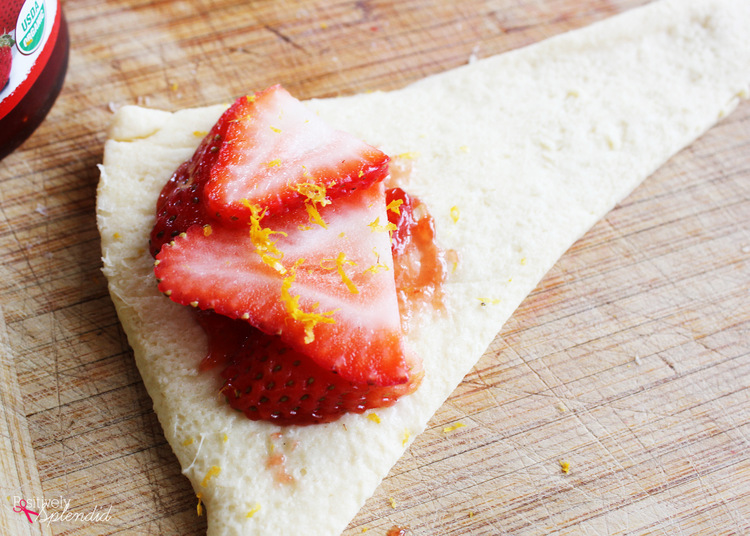 Place 3-4 strawberry slices on top of the preserves, and then sprinkle with a small amount of the orange zest. 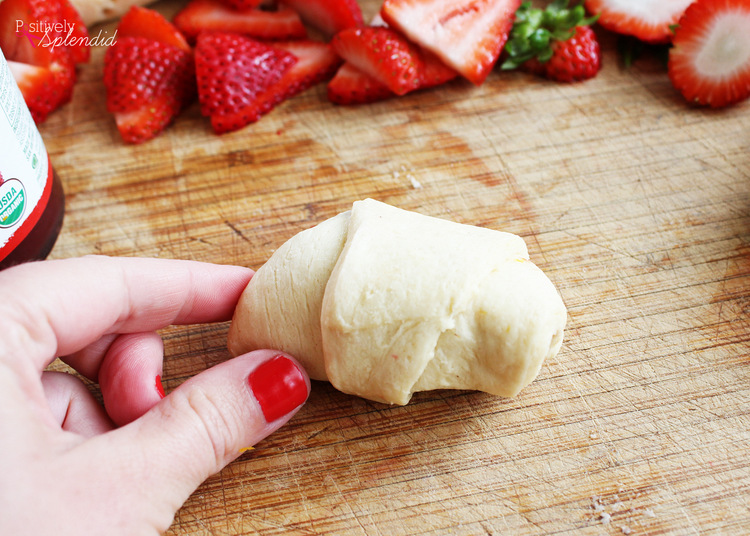 Tuck the outer points of the crescent roll dough around the strawberries before rolling the dough into a pouch, pinching the ends to seal. 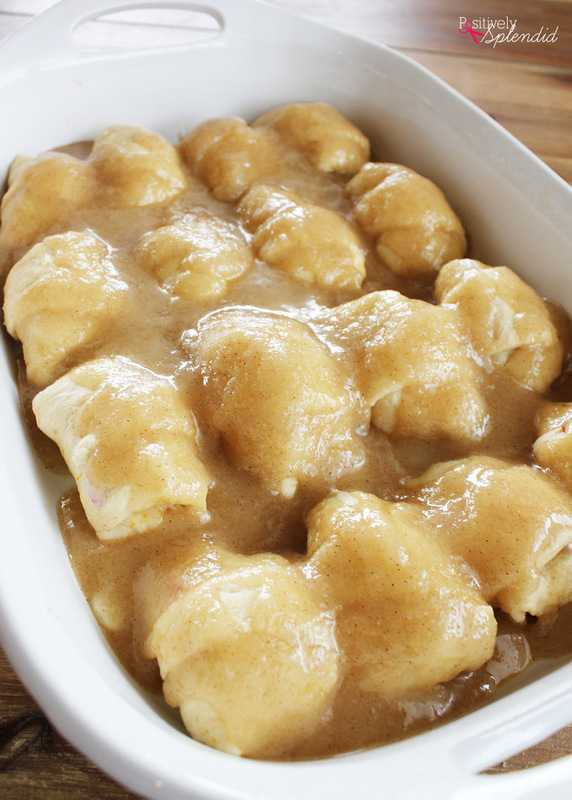 Place the rolled dumplings into a greased 9x13" baking dish, placing four dumplings in each row. Repeat this process with the remaining dough until you have completed 16 dumplings. Combine the butter, sugar, cinnamon and vanilla extract in a medium bowl. Pour evenly over the dumplings in the pan. Pour 1 cup of ginger ale evenly over all layers. Do you have any MOMENTOUS Mother’s Day memories? Maybe a fantastic meal you prepared for a special mom in your life, or possibly a handmade gift? Share your memories (including photos, if you have them!) on Facebook and Instagram using the hashtag #HEBMoms and tagging @HEB in your posts and then come back and let me know about it in the Rafflecopter below. TWO lucky winners will be chosen at random to each win a $50 HEB gift card! The giveaway will end at 12:00 AM on May 9, 2016. You can enter up to one time per day on both Facebook and Instagram, so the more memories you share, the more you increase your chances to win! Good luck! Previous Post: « For Dad.